Low-level metals analysis now available! Fairway Labs is excited to announce that we are now certified to perform metals analysis by EPA Methods 200.8/6020 using ICP/MS technology! This additional certification allows us to analyze your metals samples to satisfy low-level reporting requirements. 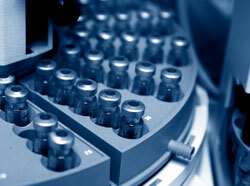 Contact us today to discuss your analytical needs! Welcome to Fairway Laboratories, Inc! Fairway Laboratories is a full-service, NELAP (National Environmental Laboratory Accreditation Program) certified, environmental laboratory servicing Pennsylvania, and surrounding states. Established in 1977, we use state-of-the-art technology to analyze drinking water, wastewater, soil, and sludge samples for an extensive list of parameters. Supporting this analysis is Element DataSystem by Promium, a laboratory information management system (LIMS), which captures sample and analysis details. This information can be reported in various paper and/or electronic formats that are informative and meet governmental and regulatory requirements. Whether you are a consultant, engineer, municipality, drinking water supplier, government agency, industrial plant, or homeowner, the experts at Fairway Laboratories can meet your environmental analysis requirements. To request a username and password, contact Fairway Laboratories via email or by phone.